Bullets, Babes, Boats and Jackie Chan. From the crazy pages of Tsukasa Hôjô‘s (Angel Heart) manga comes Jing Wong‘s (Boys Are Easy, A True Mob Story) and Tsukasa Hôjô‘s live action version, with the stunning visuals that can Only come from the main star Jackie Chan (Jackie Chan’s Police Story & Police Story 2, The Lego Ninjago Movie 3D, Kung Fu Yoga, Drunken Master, Police Story: Lockdown). Doing some of his most energetic stunt work in this full on comedy, that just couldn’t be made today fight film. Now with the Eureka Classics treatment, this is definitely one to add to your martial arts and Jackie Chan collection. But for people new to the amazing Jackie Chan do not believe the BBFC classification of a , as there are innocent people getting executed left, right and centre. Even if this is a comedy, you need that ability to look past the bullets and the fake blood. So please be advised before buying for minors. 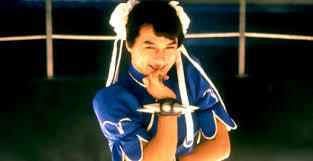 City Hunter private eye Ryu Saeba (Chan) lives in a dream world of beautiful scantily clad girls. What brings him back to the real world is the daughter of his late partner and his sidekick after looking after her from childhood, Kaori Makimura / Carrie (Joey Wang, A Chinese Ghost Story, The Big Heat) who has romantic feelings for the daydreaming private eye. Once pulled out of his daydream he has a new case, find the daughter of a newspaper tycoon Shizuko Imamura / Kyoko (Kumiko Goto, Tale of the Crane Princess) who has run off, Ryu isn’t really interested until he sees a photo of her, which upsets the ignored Carrie and she goes off on her own as Ryo sets out to find Kyoko. Using his local contacts he finds her at a skateboard park. Which leads to a unique skateboard chase through the city as Kyoko refuse to go back to her father and makes a run for it. With great stunts and action the film leads to a cruise ship full of millionaires and the daughter of a tycoon and a stowaway City Hunter in search of his quarry and food, he really wants some food. But what the Colonel (Richard Norton, Mad Max: Fury Road) and his henchmen (Gary Daniels, Tekken, Fist of the North Star) want is money and only City hunter, Kyoko a card throwing card-shark Kao Ta (Ken Lo, Rush Hour, The Myth) a police woman Saeko Nogami / Anna (Chingmy Yau, Naked Killer) and her sidekick (Carol Wan, Flirting Scholar) can stop them. With lots of violence and martial arts this is a showcase of Chan’s talents and the other main cast members and if you are a fan of the Streetfighter video game this is a must see.